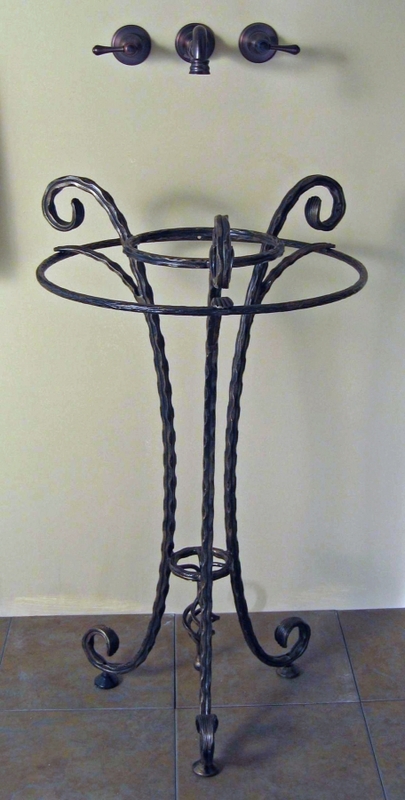 This elegant sink base is created from forged iron that has three legs that have a simple twisted pattern and are shaped with a gentle curvature that hold the sink bowl and make the feet at the base. The iron material is available in a variety of finishes and will hold many types of vessels. Material: Iron is a hard ferrous metal. It is made by the same refinement process as steel but is left with more impurities. Iron is used in building structures and anywhere large heavy loads are in need of support. Forged Iron is heated and shaped to achieve a desired form.